which does not very well fit on one line. How can I split this over two lines? 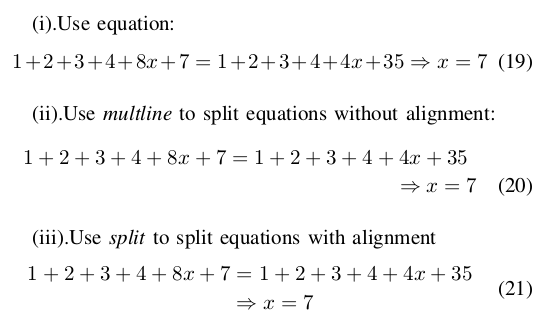 What I have in mind is that I specify the splitting place, and that the first line is left aligned and the second line right aligned to make clear that it is still the same equation. The linebreak \\ does not work. The users guide to amsmath is called amsldoc.pdf, but you can access it by typing texdoc amsmath on the command line. The main environments you'll use there would be align, split, and multline. You can use multline or split provided by amsmath package. For more info, you can refer to User’s Guide for the amsmath Package. I replaced the outermost parentheses with large fixed-size parentheses, \Biggl( and \Biggr); scale these according to your taste. The \mspace command adds horizontal space in math mode, on the first line. Thus, the first line is not so much left-aligned, as it is right-aligned with a fixed amount of white-space added at the end. Vary this according to taste as well. You can split your equation across several lines by employing \notag\\ several times where desired. If you would prefer the equation number to straddle the two lines, as opposed to being placed on the last line, nest the mathematics inside a split environment (and omit the \notag commands); this would otherwise work verbatim. so this next part is aligned to the right in the following line, looking smart. Not the answer you're looking for? Browse other questions tagged math-mode equations line-breaking breqn or ask your own question. How to break a long equation? How do I split a long equation with equal sign on new line? No multilingual support cannot enable multilingual quotes on input line? How to break long expressions automatically in displaymode? How can I split this equation? How can I separate an equation over two or three lines?